Simultaneous pipetting of 96 channels provides timely addition of liquids directly into microplates. Tecan‘s 96-channel pipetting head (MCA 96) brings higher productivity to almost any automated liquid handling process, from drug discovery and compound management to biotechnology or genomics applications. The MCA 96 head can also operate as an 8- or 12-channel pipette by picking up a single column or row of disposable tips. This feature can be used to pipette controls or to conduct serial dilutions. The MCA 96 has the flexibility to work with both disposable and washable tips, which can be automatically exchanged during a run. Using fixed washable tips for the pipetting of reagents or solvents offers a reduction in running costs. The optional gripper module is able to move labware microplates, tip boxes, plate transfers onto Te-VacS SPE manifold on the worktable, reducing investment costs for an additional robotic arm. An MCA 96 on a Freedom EVO® 100 is pipetting with 96 DiTis from a 96-well plate to another 96-well plate. An MCA 96 on a Freedom EVO 100 is pipetting with 96 DiTis from a trough to a plate. 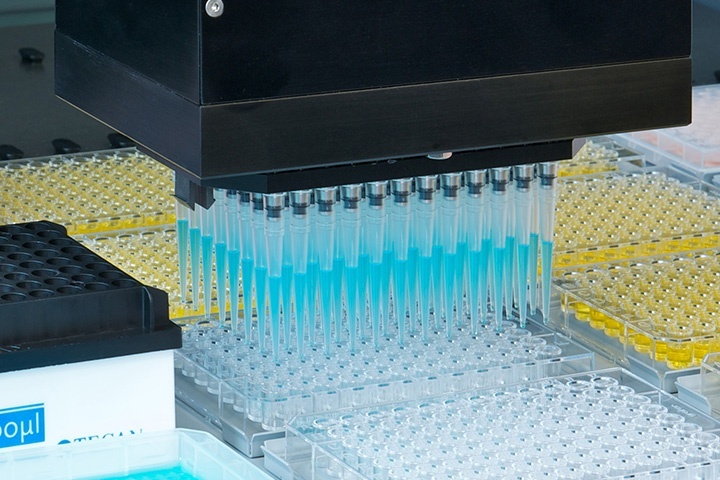 An MCA 96 on a Freedom EVO 100 is performing a multi pipetting from a deep-well plate into three microplates. An MCA 96 on a Freedom EVO 100 is using a column of eight DiTis to perform a multi pipetting over a microplate. An MCA 96 on a Freedom EVO 100 is using one row of DiTis to perform a serial dilution over a microplate. An MCA 96 on a Freedom EVO 100 is using one single DiTi to pipette out of an Eppendorf tube. An MCA 96 on a Freedom EVO 100 is using nested DiTis for pipetting. After usage the MCA 96 DiTis are stacked on a waste stack. An MCA 96 on a Freedom EVO 100 is using nested DiTis from an individual access carrier for pipetting. After usage the MCA 96 DiTis are stacked on a waste stack. An MCA 96 on a Freedom EVO 100 is using nested DiTis from an individual access carrier for pipetting. After usage the MCA 96 DiTis transferred into the waste. An MCA 96 fixed tip block on a Freedom EVO 100 gets cleaned in the wash station. A complete pipetting cycle with nested DiTis coming from a Te-Stack™ is performed by the MCA 96 head. An MCA 96 on a Freedom EVO 100 in combination with four Te-Stacks for high throughput pipetting. Thermo Fisher Scientific is helping to drive biotherapeutic research with the development of innovative sample processing tools designed to simplify and accelerate analytical workflows. Offering automation-friendly affinity purification for proteins and antibodies, this provides a robust solution for high throughput preclinical research and development. Freiburg-based Oncotest GmbH specializes in preclinical pharmacological contract research, and has successfully automated 3D cell culture on a Freedom EVO® workstation using polystyrene-based Alvetex® Scaffold 96-well plates from Reinnervate.